Lot Detail - 1929 US Open (Jones Win) Contestant Badge of '36 US Open Champ Tony Manero - Stunning Condition! 1929 US Open (Jones Win) Contestant Badge of '36 US Open Champ Tony Manero - Stunning Condition! 1929 US Open (Jones Win) Contestant Badge of 1936 US Open Champ Tony Manero - Stunning Condition! Offered in this marquee lot is certainly one of the finest examples of the seldom scene 1929 contestants pin. This pin served as a badge of passage to the course for the elite few golfers who had risen to the apex of competition in The United States. This badge belonged to Tony Manero, who went on to win his very own US Open title in 1936! 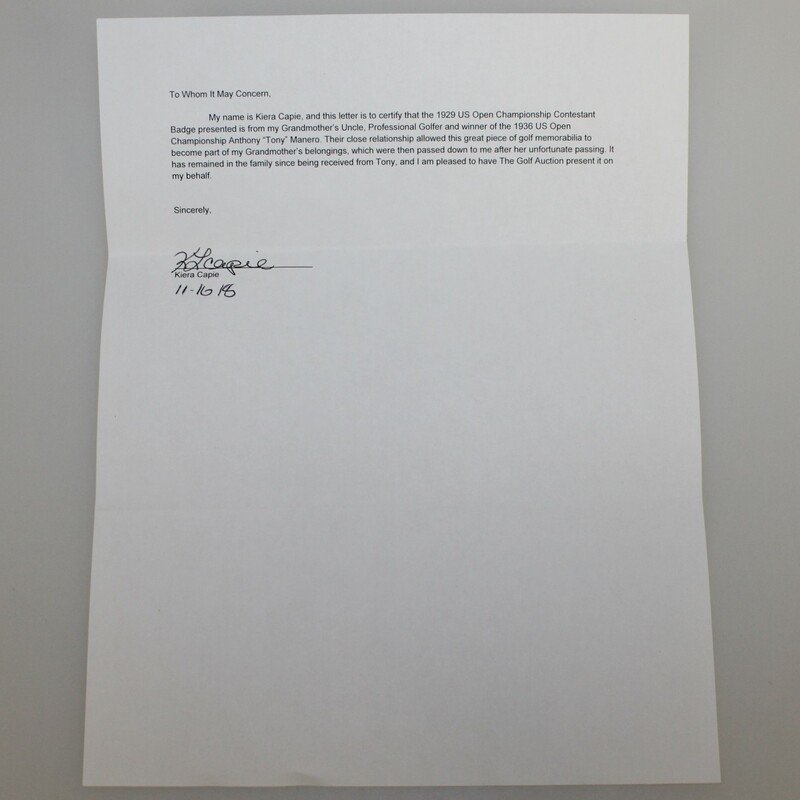 This badge comes with a signed letter of provenance from Kiera Capie. Tony Manero was her Great Uncle and verifies the badge stayed within the family for all these years. In the 1920's, the United States Golf Association applied a similar design for this badge. 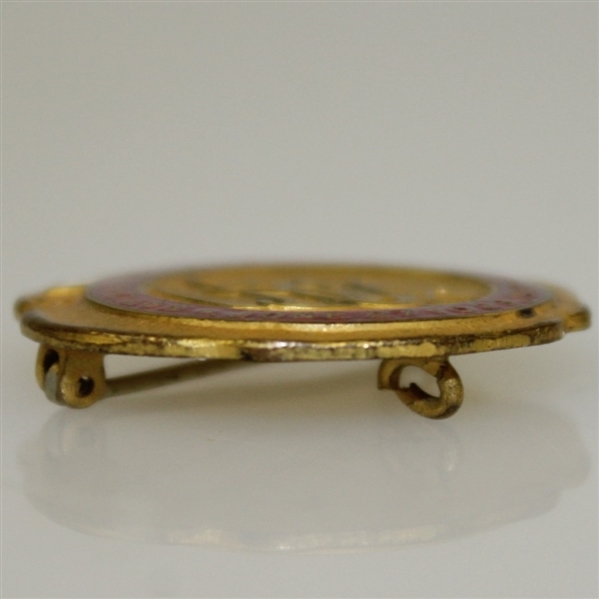 The 1929 badge presents as a circular pin featuring a scalloped edge of gold. 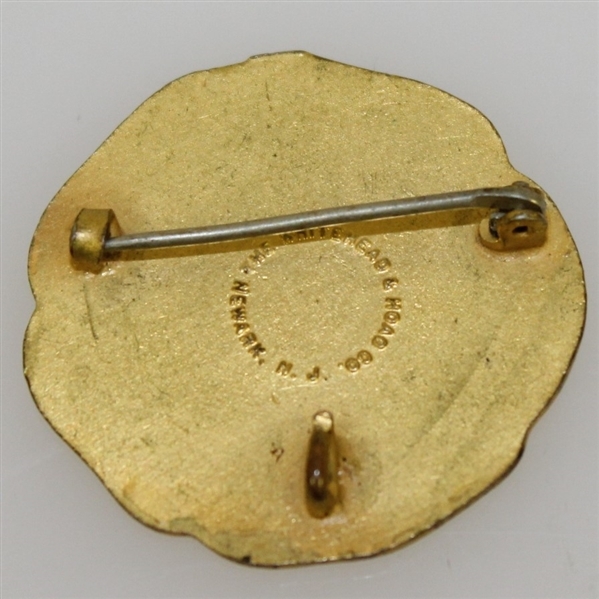 At the top of the pin in white enamel is the wording "CONTESTANT". 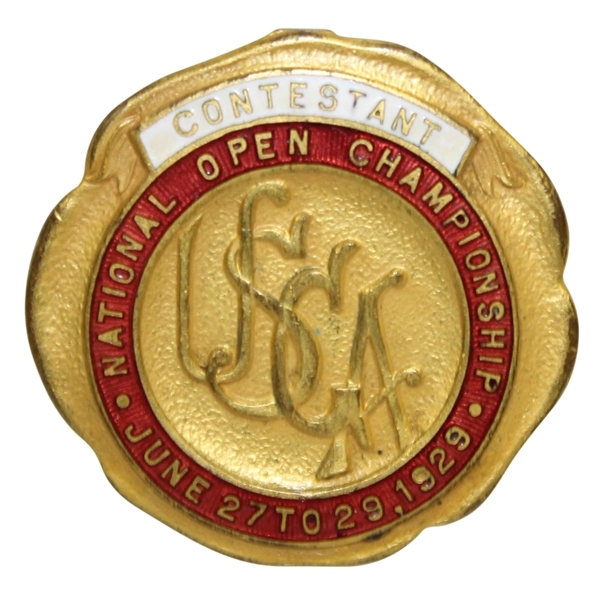 Encircling the pin in bright red enamel is "NATIONAL OPEN CHAMPIONSHIP JUNE 27 TO 29, 1929". The interior area of the badge has raised scripting "USGA". This is a spectacular high-grade example of this early contestants badge, with perfect enamel and with only the slightest hints of light wear visible along the border. The reverse contains the stampings of the manufacturer Whitehead & Hoag. Co. Newark, N.J., and its original clasping pin is still operational today. As significant as this badge is for scarcity and condition of equal appeal to collectors is that the champion in '29 was Bobby Jones. In the 1929 U.S. Open contested at Winged Foot Golf Club, Jones opened with a first round 69 accomplished through a superior 31 second nine that day(his career best 9 holes of any US Open). At the end of four rounds of play Jones remained tied with Al Espinosa. The 36-hole playoff the next day saw Jones put a staggering 23 stroke exclamation point win to post his 3rd U.S. Open Championship. This 1929 Contestants badge provides all the requisites of the ideal golf collectible, and would be a worthy inclusion or upgrade in just about any advanced collection.